One of the cool things about my work is that my clients are often giving me cool stuff. I’ve gotten gift cards, shopping sprees, T-shirts, chef-quality knives, toys for my kids and loads of food. By far, one of the best gifts I ever received from a client was a steam carpet cleaner from Bissell. I use my steam cleaner regularly to keep my home in tip-top shape. Sometime after receiving my Bissell steam cleaner, I had to change the belt. I didn’t want to call the Customer Care line for fear of looking like an idiot in front of my client. I know they wouldn’t have made me feel silly, but I wanted to maintain a sense of creditability with them. LOL! My husband was at work, and I needed to clean the carpet before a dinner party. So I was on my own. I went to Bissell’s website in search of instructions for replacing a belt. Much to my surprise, Bissell had a “how-to” video for replacing a brush belt right there on the website. The short video was clear and easy to follow, and within a couple of minutes, I had replaced my belt! Ecstatic, I called my client to compliment them on such a high form of customer support. That was 7 years ago. An online how-to video was very unique back then. From that point on, I’ve been encouraging my clients to use online video, specifically YouTube, as a customer support channel for customers. All day, every day, customers are going online to forums, company websites, Twitter, and YouTube for help. Why not meet them where they are and pleasantly surprise them with support? One of the best examples of YouTube Customer Support I’ve seen is the Lowe’s YouTube Channel. Lowe’s has over 400 how-to videos on everything from how to install lighting under your kitchen cabinets to how to install a hardwood floor. 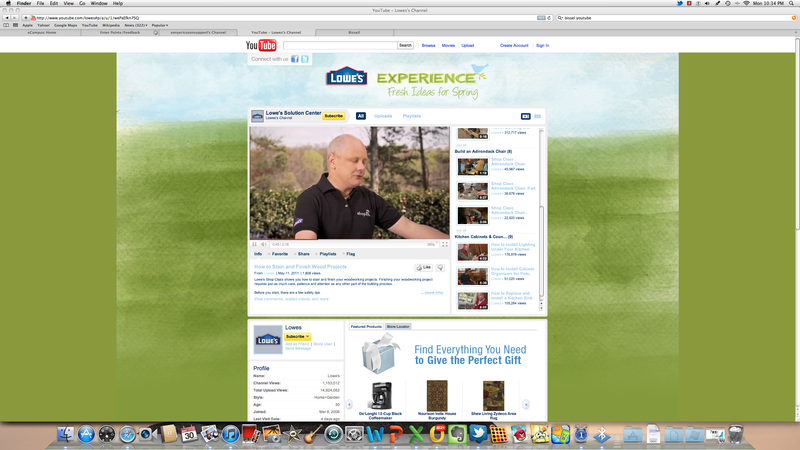 Consumers can get instruction and inspiration from Lowe’s YouTube channel. Without question, the channel is both building and strengthening customer loyalty. The Bottom Line: Include online video customer support via YouTube. You’ll offer a more convenient support to your customers, surprise and delight customers and save money in the process. I wish I could help you with this one. I’m not affiliated with YouTube and I cannot respond to this. Good luck! Next Next post: Trying to Get Customer Service Representatives to Convey Empathy? Here’s How.